Pumpkin Bread is great for fall. Who doesn’t have a tough time with baked good temptations in the fall and winter holiday season? My solution is to make those 250 + calories count for real nutrition rather than most of the calories coming as empty calories from sugars or butter. 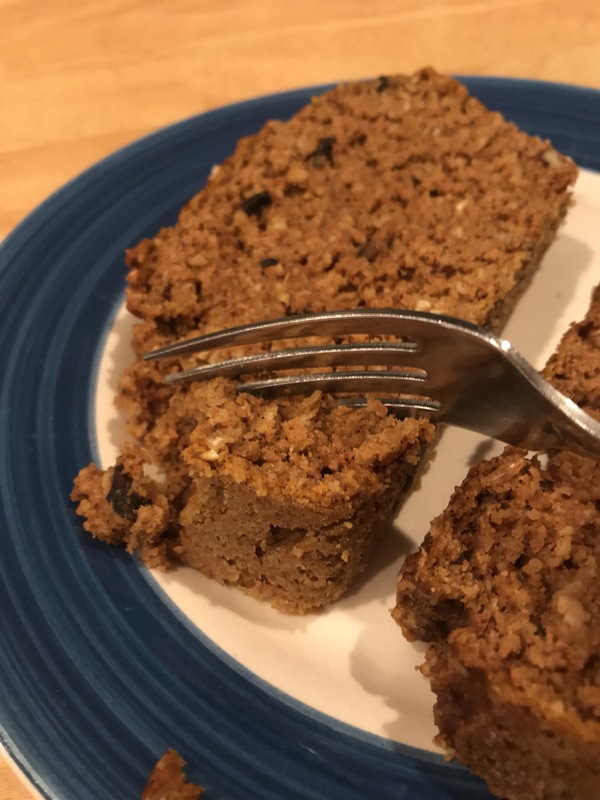 This is my original recipe for a pumpkin bread that will double nicely as a healthy breakfast or daytime snack. I say daytime because I typically eat my carbs earlier in the day. Less likely for unused energy to turn to fat during daytime hours. 3 cups plain Quaker Old Fashioned oats. Optional: 1 cup of zero calorie sugar substitutes for baking (recommend Truvia for baking or Splenda for baking. NUTRITION: full loaf cake is 7 servings. 278 calories: 20 grams of protein, 31.7 grams of carbs, 7.7 grams of fat. Only 4.9 grams of sugars from the pumpkin. No added sugars. Chopped pecan pieces: 1/4 cup adds 20 calories per serving and 2 grams of fat. Two snack boxes of raisins (1/4 cup) adds 25 calories of carbs from natural sugars per serving. Avoid if watching sugars! This little bit doubles the sugar content. Mix oats in food processor until ground into coarse flour. Mix all ingredients into large mixing bowl and stir together. Spray loaf pan with a light spray of spray coconut oil. Dust with oat flour for a perfect non-stick if desired. Pour batter into prepared pan and place in oven to bake 40-50 minutes. Cake should not be shloshy in the middle, but you do want it very moist. Do not over bake!! It should rise and be firm. Enjoy at breakfast, brunch or even post workout with coffee or hot tea! This healthy recipe has your heart healthy oats, proteins from whey and eggwhites. Healthy fats from almond meal and maybe pecans. Not to mention lots of vitamin A, plus Vitamins C, calcium, iron and fiber from pumpkin while avoiding empty calories that have no nutritional value from processed enriched flour, butters, sugars etc! Enjoy guilt free if you avoid adding butter or jams! Would it taste good with butter or jam? Sure. If you do add these traditional enhancers is it going to make you fat? Well, in short…yes. Yes it will. Not so much as a second bowl of ice cream and cake, but it does make a difference if you want a healthier lifestyle. Refrigerate and warm in the microwave or oven by the slice. Eat the healthy. When a women over 45 tells me she does not want to lift weights as she does not want to “bulk up” I just want to scream. At age 35 we begin to steadily lose muscle mass. You don’t see many 18 or 20 year old worrying about “toning up” do you? That loss of muscle tone and loss of muscle strength is just flat lost muscle. You can get it back with weight training. Remember the commercial that we have all seen for Lifealert, “Help, I’ve fallen and I can’t get up!” Coming from the perspective of middle age or younger, I had always assumed that she was injured in the fall. However, she did not say, “Help, I’m hurt, and I can’t get up.” I work with folks with age related muscle loss, and I understand the importance of weight training as we age. I had a revelation, and maybe it did not occur to you. The elderly lady on the floor couldn’t get up because she was too weak. She did not have the muscle strength to get herself off of a floor! The University of Cambridge studied 90 women over-75 in the Cohort Study of aging and health. During the one year study, 60 percent of participants reported falling, and of those who fell, 80 percent or four out of five, needed help getting up, and 30 percent remained on the floor for over an hour. One method of improving strength with aging is to get enough calories from protein each day, in each meal, to sustain muscle mass. Growth hormones in our younger years provide new cell growth, and we often do not have to eat and exercise as diligently to maintain strength and muscle tone the same way that is needed later in life. As a result strength and muscle decrease year after year that we do not maintain it. The primary treatment for age related muscle loss, also known as sarcopenia or skinnyfat, is exercise, especially strength training. Muscle growth and muscle strength are often referred to as “muscle tone.” Muscle tone is essentially a euphamism for the onset of muscle firmness. Greater muscle size is only achieved after the muscle has first firmed, grown, and strengthened. Turn back the clock on aging and strength train! Recipes for a Fit Fall! samanthakbowman on Back to workouts! Jill Johnson Bennett on Back to workouts! lexilife on Back to workouts!